Background and Purpose: Diabetes has adverse effects on the quality of life of patients. Roy's adaptation model could be used to enhance quality of life among diabetic patients. This study aimed to evaluate the effects of Roy's adaptation model in nursing practice on the quality of life in patients with type II diabetes. Methods: This quasi-experimental study was conducted on 60 diabetic patients randomly divided into two groups of experiment and control (N=30) at Hamadan Diabetes Research Center. Data were collected using Diabetes-Specific Quality of Life Scale (D-39) in five dimensions, which was completed before and after intervention in both groups. Educational care programs were executed based on Roy's adaptation model only for experimental subjects in five sessions during one month. Data analysis was performed using independent and paired t-test in SPSS. Results: At the beginning of the study, both groups were matched in terms of demographic characteristics and quality of life dimensions (P>0.05). Comparison of mean scores of quality of life areas between the two groups before and after intervention was indicative of a significant difference in the aspects of diabetes control, energy and mobility and social support (P<001). However, there was no significant difference in the dimensions of stress, anxiety and sexual activity (P>0.05). Conclusion: According to the results of this study, use of Roy's adaptation model has positive effects on some dimensions of quality of life in patients with type 2 diabetes; these domains were diabetes control, energy and mobility, and social support. However, further studies with longer durations are required as to investigate the efficacy of this model in the areas of anxiety and sexual activity. Background and Purpose: Hemodialysis is the most efficient treatment of end-stage renal disease (ESRD), which increases patients' life expectancy. However, it can cause various adverse physical and mental side effects. The aim of this study was to determine the effects of emotional intelligence training on anxiety of hemodialysis patients in Khorramabad, Iran. Methods: This experimental study was conducted on 74 patients admitted to the hemodialysis ward of Khorramabad hospitals during 2014. The patients were randomized into experimental and control groups. Emotional intelligence training was provided to the experimental group by trained and skilled researchers during two months, within eight sessions. The data collection tools included demographic profile checklist, Spielberger's anxiety questionnaire and emotional quotient inventory (EQ-i), which was filled out by the researcher's assistant throughout the interviews before and after the intervention. The data were analyzed performing covariance analysis, Chi-squared as well as independent and paired t-test, using SPSS 19. Results: Before the intervention, independent t-test indicated no significant differences in the emotional intelligence scores of the two groups, but after the intervention, this score increased in the experimental group (P=0.01). The mean state-trait anxiety was not significantly different in the two groups before the intervention. Whereas after the intervention, a significant decrease in the anxiety scores of the experimental group was observed (P<0.001). Conclusion: Emotional intelligence training alleviated the anxiety of hemodialysis patients; therefore, implementing emotional intelligence training is recommended for lowering anxiety in hemodialysis patients. Background and Purpose: Clinical knowledge management (CKM) is considered as a dominant approach for information management and expansion of knowledge in clinical settings. Health care executives have recently begun to focus on CKM. Therefore, identification of challenges against proper CKM planning is of paramount importance. 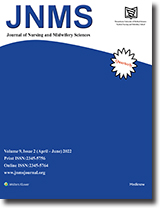 The aim of this study was to explore challenges in clinical knowledge management in nurses. Methods: This qualitative study was conducted at four teaching hospitals in Tehran, Saqqez and Mahabad, Iran through 24 semi-structured interviews with 18 nurses, head nurses and nursing supervisors. Data analysis was performed using conventional content analysis. Results: In this study, three main themes emerged from data analysis. The main theme was “organizational culture of less attention to the creation and dissemination of knowledge in nurses”, which was due to poor scientific interactions between clinical and academic settings. Other factors involved in this theme were disregard of research in job description of nurses, authoritarian management in research centers, inadequate support and reward from medical officials, and non-observance of research in the evaluation of nurses. Another theme was “poor scientific documentation in nursing”, which was due to lack of awareness on the significance of clinical ideas, and proper dissemination of nursing knowledge. Finally, the main theme of “hardness of working conditions” represented high work pressure and lack of opportunity for research among nurses. Conclusion: It is suggested that nursing managers consider the improvement of organizational culture in strategic plans proposed by the Ministry of Health, in addition to reducing work pressure for nurses. Furthermore, scientific promotion of nursing practice should be taken into account through implementation and documentation of useful and relevant workshops. Background and Purpose: Hand hygiene is a low-cost? convenient measure recommended to all health care providers to prevent nosocomial infections. Health care staff commonly neglect the importance of hand washing at workplace. This study aimed to evaluate the effect of involuntary motivational factors on hand hygiene compliance byhealth care providers. Methods: This descriptive analytical study was conducted on 153 health care providers. selected via simple random sampling.Data were collected using questionnaires designed based on the theory of planned behavior (TPB). Data analysis was performed in SPSS, using descriptive and inferential statistics, Pearson's correlation-coefficient and T-test. Results: In 80.40% of cases, participants reported that they washed their hands after contact with patients or hospital equipment. Moreover, participants had a positive attitude towards the consequences of hand washing (6.11±0.8) and considered this behavior as a norm (6.12±1.2). Correlations observed between most variables of study were significant (P<0.001). However, controlling factors had a less significant effect on hand hygiene intention compared to other variables, such as outcome evaluation, subjective beliefs and normative beliefs of participants (P<0.001). Conclusion: According to the results of this study, health care providers have a positive attitude towards hand hygiene compliance. However, due to the impact of involuntary motivational factors on this behavior, it is necessary that medical authorities identify major strategies for behavioral change of health care staff through predicting these underlying factors. Background and Purpose: Oxygen therapy is one of the common treatments for neonates with cardiopulmonary disease. The aim of this study was to evaluate adherence to oxygen therapy standards by nurses before, during and after using oxygen hood. Methods: In this cross-sectional study, 250 cases of nursing care were evaluated before, during and after administration of oxygen hood therapy in preterm infants. The observations were conducted according to the standards of the neonatal intensive care units (NICU) of hospitals affiliated to the Ahvaz University of Medical Sciences. The data collection tools included a self-designed checklist for nursing audit evaluating the performance of NICU nurses working by neonatal oxygen hood, and a demographic profile checklist. The data were analyzed by Chi-square and Spearman tests, using SPSS version 18. Results: The results demonstrated insufficient adherence to the standards of oxygen therapy by 90% of the nurses before neonatal oxygen hood. Moreover, regarding the mentioned standards, 84% and 99.2% of the nurses had moderate and poor performance during and after oxygen therapy, respectively. Conclusion: Considering the poor performance of the NICU nurses before, during and after oxygen therapy, appropriate supervision and training programs for nurses is recommended to promote their capabilities in this regard. Background and Purpose: Professional autonomy in nursing is defined as working in a self-determined environment and making decisions based on professional judgment. This study aimed to evaluate professional autonomy and its association with individual factors in nurses employed at teaching hospitals affiliated to Kerman University of Medical Sciences in the southeast of Iran in 2013. Methods: This was a descriptive analytical study, and required data were collected by quota sampling using self-administered questionnaires, which were completed by 385 nurses at four teaching hospitals in Kerman, Iran. Data analysis was performed using inferential (ANOVA) and descriptive statistics (mean and frequency) in SPSS V. 18. Results: In this study, a significant correlation was observed between professional autonomy and age (P>0.001), gender (P=0.04), work experience (P>0.03), education level (P>0.02) and attitude of nurses. Moreover, a positive correlation was found between the mean scores of professional autonomy and nursing experience (r=0.559). Conclusion: According to the results of this study, general attitude of nurses towards professional autonomy was relatively positive. In addition, professional autonomy was observed to increase with higher education level and job satisfaction. Hierarchical team decision-making may restrict professional autonomy in nurses. Therefore, it is recommended that nursing skills and professional autonomy of nurses be improved through appropriate methods. Background and Purpose: Sleep disorders are a common problem in patients undergoing hemodialysis. Poor sleep quality is considered as a potential predictor for mortality and reduced quality of life in these patients. This study aimed to evaluate subjective sleep quality in hemodialysis patients and its association with hemodialysis timing. Methods: This descriptive-correlational study was conducted on 125 patients undergoing hemodialysis in eight teaching hospitals affiliated to Mazandaran University of Medical Sciences, Iran in 2015. Dialysis patients were selected from all the timings. Subjective sleep quality was measured using Pittsburgh Sleep Quality Index (PSQI). In addition, participants completed Beck Depression Inventory (BDI). Data analysis was performed by using Chi-square test, ANOVA and logistic regression model. Results: In total, 210 patients were enrolled in this study, and 79 patients (63.2%) had poor sleep quality. Moreover, no significant association was found between subjective Sleep quality and hemodialysis timing. However, age (β=0.017, confidence interval [CI]: 0.003-0.034, P=0.034), unemployment (β=0.695, CI: 0.0458-2.7702, P=0.043) and residence in rural areas (β=0.435, CI: 0.072-1.777, P=0.033) were identified as significant predictors for poor sleep quality. Conclusion: According to the results of this study, poor sleep quality had no significant correlation with hemodialysis timing. Since subjective sleep quality is a common problem in hemodialysis patients, nursing care plans should be implemented to improve this parameter and quality of life in these patients. Background and Purpose: Personal identity is the sense of being distinct from other individuals, which is of paramount importance during adolescence. Modern theories suggest that young adults perceive personal identity in different ways, and several factors affect this phenomenon. Leisure time activities are a significant element during adolescence. This study aimed to evaluate the relationship between identity styles and leisure activities in adolescents. Methods: This descriptive-correlational study was conducted on 370 high school students in Birjand, Iran in 2013.Students were selected via stratified two-stage random sampling. Data were collected using Identity Style Inventory (ISI-6G, Berzonsky) including domains of informational, normative, diffuse-avoidant and commitment identity styles, and leisure time questionnaire including indices of different products, activities, spaces and internet use, in leisure time. Data analysis was performed using student's T-test, Mann-Whitney, one-way ANOVA, Kruskal-Wallisand Spearman's correlation-coefficient, and P value of less than 0.05 was considered significant. Results: In this study, a significant positive correlation was found between diffuse-avoidant/informational identity styles and use of internet (P<0.05), informational style and use of space (P=0.01), normative style and leisure activities (P=0.02) and commitment style with different products (P=0.03). Moreover, a significant negative correlation was observed between commitment identity style and use of internet (P=0.02). Conclusion: According to the results of this study, leisure time activities have a remarkable effect on identity styles of adolescents. Therefore, families and organizations concerned with adolescence affairs should monitor quality of leisure activities in teenagers. Background and Purpose: Violence is defined as unnecessary hostile behavior in clinical environments, which may lead to psychological abuse by colleagues. This systematic review aimed to evaluate violence and its associated factors among nurses. Methods: In this study, we searched for articles and patented documentations published until December 2014 via databases such as PubMed, Medline, Scopus, Google Scholar, Iranian Journal Database (Magiran), Scientific Information Database (SID), IranMedex and Iranian Biomedical Journal. Using keywords such as violence, horizontal violence, lateral violence, prevalence, predisposing factors and bullying, we found 84 articles out of 19,000 search results. Results: Violence has a variable definition in different cultures. Violent behavior in clinical environments is influenced by factors such as age, gender, work experience, work shifts, working hours and employment status of medical staff. In nurses, violence could lead to adverse outcomes, such as physical and psychological damages. Conclusion: According to the results of this study, male and younger nurses are more frequently exposed to violent behavior compared to female and elder nurses. Therefore, nurses should be informed on the adverse effects of violent behavior. In this regard, authorities and management of medical centers should show zero tolerance for violent behaviors on behalf of nursing staff. Holoprosencephaly (HPE) is a rare congenital brain malformation associated with multiple midline facial defects. This anomaly is resulted from the failure of diverticulation and cleavage of primitive prosencephalon during weeks 4-8 of gestation. HPE is the most common forebrain developmental anomaly in human with the incidence rate of 0.49-1.2 cases per 10,000-20,000 term births. In this study, we described a case of HPE in a neonate with gestational age of 32 weeks. Antenatal ultrasonographic diagnosis was performed, and the infant was presented with macrocephaly, bilateral microphthalmia, hypotelorism, proboscis and ambiguous genitalia.